March 13, 2018 - Baltimore, MD - The National Facilities Management and Technology Conference and Exposition (NFMT) will take place in Baltimore March 20-22, and Solus Group will be there. Facilities management professionals who stop by the Solus Group booth (#2454, in the Building Services wing of the expo) will have the chance to see a Simpro Dumpmaster Bin Tipper in action. This ergonomic dumping machine safely lifts and empties industrial containers of all types, including high-capacity trash cans. Unlike comparable dumpers from other manufacturers, Simpro Bin Tippers invert bins as they lift, keeping the load centered over the machine's frame. This creates superior stability and efficiency, as NFMT attendees will see all week long at booth 2454. "There's nothing like seeing a Bin Tipper in action to understand how much it can help, how many sore backs it prevents," said Jen Fehrmann, Business Development and Marketing Manager at Solus Group. "The benefits are easy to see when you get a demonstration." Solus Group senior staff will be available to demonstrate the Bin Tipper's unique action and answer questions about this and other pieces of material handling equipment available from the online dealer. In addition to seeing the Dumpmaster demonstration, visitors can watch videos of the other Bin Tippers Solus Group offers. "We're definitely hoping to meet a lot of people," Fehrmann said. "That's the great thing about NFMT; it's just this massive gathering of people who are really dedicated to pushing the field of facilities management forward." The trade show, which has been called the "Super Bowl of facilities management," brings together more than 500 companies from every sector of the facilities management industry. Attendees will have the chance to hear experts speak on subjects as varied as dealing with occupational stress and the growing importance of the Internet of Things in the industry. 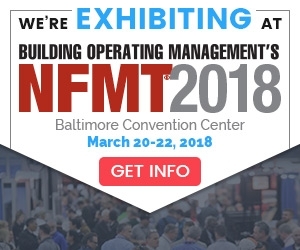 More than 5,000 facilities managers are expected to attend NFMT 2018, which takes place at the Baltimore Convention Center at 1 West Pratt Street. Visit www.nfmt.com/baltimore/ to learn more, or you can register for the event here.